Staff from the Savannah program joined 52 other vendors at a Business Expo sponsored by the Multi-cultural Chamber of Commerce in late August. The Expo provided the opportunity for local businesses to showcase their products and services to the local community. Staff used it as an opportunity to educate the public about Dismas and to recruit potential employees. With over 100 member of the community attending, many of the vendors sold their products including candles, baskets, jewelry, hair care products, clothing and other items. 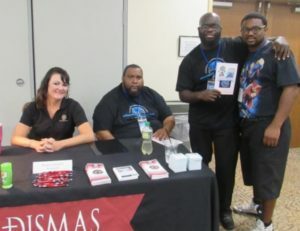 From left are Social Services Coordinator Jamie Hoff, Employment Specialist Yusef Curry, Counselor Ahmad Scott and Cook James Thomas.